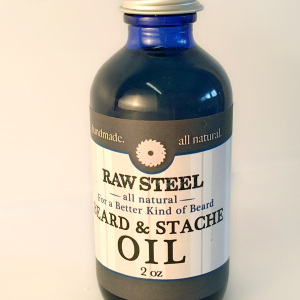 Our Raw Steel line our Beard and Stache Oil, for a better kind of beard! Made with a variety of ultra nourishing oils and all natural beeswax, this oil leave your beard conditioned without feeling greasy or gross! Pour small amount in palms and gently work into hair starting at the ends where the hair typically the most dry and damaged. 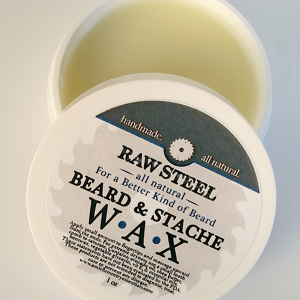 Our Raw Steel line our Beard and Stache Wax, for a better kind of beard! Made with a variety of ultra nourishing oils and all natural beeswax, this soft and smooth wax will leave your beard conditioned without feeling greasy or gross! Massage small amount between fingers and gently work into hair starting at the ends where the hair typically the most dry and damaged. Hey ladies, got a bearded beast you want to spoil? Our Beard and Stache Wax makes a great gift!